This book is meant to give you a jump-start in playing blues harmonica. You will find there are both easy and difficult techniques on the harmonica. 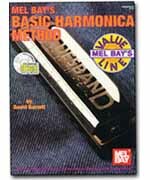 Due to the nature and length of this book, and to avoid repetition of sections of other books by the same author- some of the more commonplace blues harmonica techniques are avoided here. A 10-hole D harmonica is required to begin this book, but a Lee Oskar natural minor harmonica in the key of A minor is also recommended. All tunes and exercises in this book are written in standard notation with harmonica blow/draw indications. Although this is not a beginner's book, the enclosed CD recording provides an additional assist to players at all level.